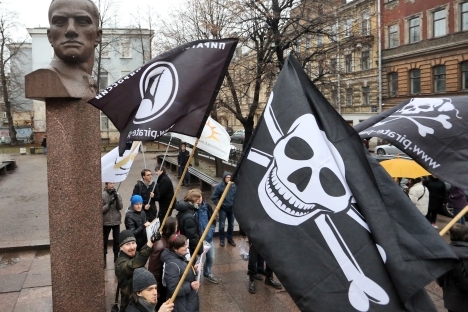 A newly signed document will oblige Russian authorities to close sites with pirated content and prosecute Internet providers who turn a blind eye to Internet piracy. In connection with its entry to the WTO, Russia has signed with the United States an agreement that contains a plan of action for protecting intellectual property rights, announced U.S. trade representative Ron Kirk. The agreement obliges both sides to fight piracy, close sites with pirated content, authorize anti-piracy raids and set aside money for financing these inspections. Russia will have to change legislation, especially when making provisions about providers’ accountability for violating authors’ rights; the country will also have to consult with the U.S. about toughening administrative responsibility for piracy. America is ready to help the Russians adopt a warning system for copyright violations – a system that, if ignored, will result in the user being banned from the Internet. A leader of one of Russia’s copyright holders’ associations expressed concerns that the plan could mean a move toward a system of Internet control in Russia that would ultimately end up benefiting American copyright holders. Internet: Big Brother, who are you watching? The agreements signed with the U.S. came about through the initiative of the American industry, which proposes that Russia play by the same rules the rest of the world adheres to, says the CEO of Universal Music Russia, Dmitry Konnov. The director of the National Federation of Music Industry, Leonid Agoronov, insists that the foundations of the anti-piracy law were laid by the Ministry for Communications more than a year ago, although no work has been carried out on them for quite some time. The clampdown on illegal content (including the use of torrents) is one of the proposals that the Ministry of Economic Development agreed upon with the Ministry of Communications, said Ekaterina Osadchaya, representative of the Ministry of Communications. Providers currently have no legal basis to monitor and block illegal content, says Valeria Kuzmenka, a representative of the company MTS. Such monitoring and control could potentially violate the rights of honest users. The person who pirated the material is the one who should face the consequences, emphasizes Vympelkom representative Anna Aibasheva. According to Oleg Yashin, vice president of anti-piracy association Russian Shield, the warning system has worked well in France: the first warning was received by tens of thousands of Internet users, the second by thousands, and the third warning (after which users are banned from the Internet) was only received by a few dozen people.